Wissensfabrik – Unternehmen für Deutschland e. V. is an association in which businesses and business-related foundations join together to support educational projects, startups and young entrepreneurs. Wissensfabrik wants to see Germany become more sustainable as a place of business and to help make the next generation ready to compete at the global scale. We at Vector have been a part of the Wissensfabrik initiative since 2012 and embody the ideas behind it. During this time, Vector has successfully established nearly 20 educational partnerships with schools at our various locations. 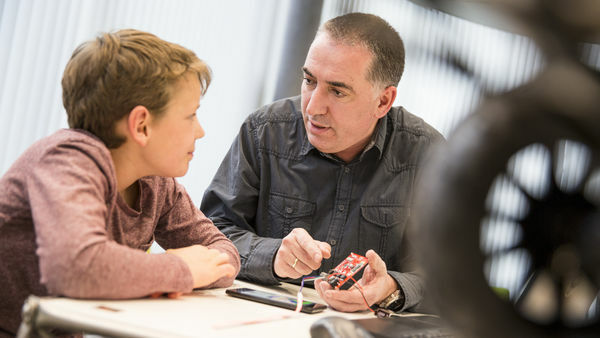 The projects “KiTec – Kinder entdecken Technik” (Children Discover Technology), “Power4School – Schüler entdecken Energie” (Schoolchildren Discover Energy), and “IT2School” enable children and youth to interact extensively with technology and computer science. Thanks to its experienced employees, Vector also supports numerous startups within the scope of the WECONOMY program. All of these projects have allowed Vector employees to inspire young people for technology, the natural sciences and the economy, and to promote interaction between startups and established businesses. Vector provides scholarships for students who are enrolled in technological programs and make excellent grades. Vector currently has specially developed scholarship programs with the following partner institutions: Esslingen University of Applied Sciences, Regensburg University of Applied Sciences, Deggendorf Institute of Technology, Karlsruhe University of Applied Sciences, Heilbronn University of Applied Sciences and Mannheim University of Applied Sciences. Further information is available here. In the Deutschlandstipendium program, Vector currently supports over 80 scholarship recipients from various fields at 12 universities. Students representing various faculties from international universities bring their passion to the racing teams at Formula Student. Since 2009, Vector has been supporting the involvement of many teams in this hands-on event, by contributing hard- and software, embedded operating systems and, above all, its expertise. Vector’s involvement enhances the practical training of students in this global competition. As part of the BORS and BOGY career guidance programs for secondary school students, Vector offers students an initial glimpse into the vocational world. This is done by means of internships, primarily in the sphere of IT (for the occupation of IT specialist or IT system support specialist). Further information is available here. Girls’ Day is a project of the non-profit, equal opportunity association Kompetenzzentrum Technik-Diversity – Chancengleichheit e. V. Vector has been part of the Girls’ Day initiative since 2003. It offers the chance for girls to become acquainted with Vector and its individual development areas, both in theory and practice.